Here we have the perfect outfit to wear for visits to the Animal Kingdom and especially for a trip on the safari jeeps! We start with a black and tan cheetah style fabric and create an aline style dress or swess top (2 inches longer than a regular swing top) and embellish the hem with a black with swirls fabric ruffle. The shoulders fasten with black buttons. 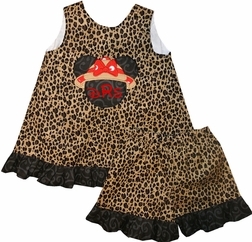 The front of the dress/top is appliqued with Minnie Mouse wearing her very own safari hat. And of course her trademark red bow trims the hat! 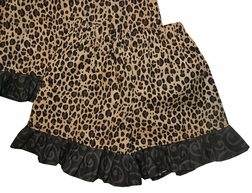 The shorts if chosen are also made with the cheetah fabric with black swirls fabric ruffles. 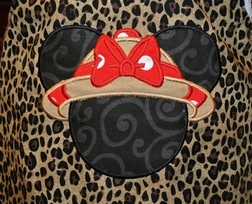 Monogram Minnie's head for extra flare and personalization.